I read about this very interesting variant recently that makes the game more difficult by introducing some uncertainty while providing more uses for the Trophies. Basically at the start of the game all adventure cards are face-down. Only one card per player is face-up. If investigators commit to a face-down adventure – they can’t back off. Every new adventure that gets added is face down. Before going on adventures, players can spend trophies to “open” a number of adventure cards equal to the trophy value. This is a very interesting option that I can’t wait to try out. It really highlights that mystery component of the game. While it makes things more random due to luck of the draw, it ups the difficulty (which is welcome) and makes trophies matter more. Out of the box Elder Sign isn’t the most difficult game. Random, yes. Difficult, no. After the first couple of plays I started looking into tweaking the difficulty and it’s amazing how many variants people have come up with to increase the difficulty of Elder Sign, ranging from the obvious adding of a mandatory doom token every midnight to the more complicated face-down variants. The easiest way to officially adjust the difficulty is with the expansion, Unseen Forces, which is a great expansion and I will always include it. But it didn’t change what bothered me the most: being devoured. According to the official rules, when you are devoured, you just draw another character. Yep. Cheap. If I were and Elder God, I would put an end to life on Earth too…cheating investigators. Another way you can play is with player elimination. Elimination forces you to be more careful about your choices but it’s never fun being the last player in a cooperative game, or at least this one. So. How do I deal with being devoured. Well, I followed in the footsteps of Elder Sign‘s granddaddy Arkham Horror and decided to add the “delayed” mechanic. You can use this house rule with either vanilla Elder Sign or with Unseen Forces. This is how it works. 1. You are reduced to zero stamina or zero sanity. 2. Lose all items and trophies. 3. If zero stamina, go to Entrance, or First Aid Station if using US expansion. If zero sanity, go to Entrance, or Chapel if using US expansion. 4. Regain all stamina OR sanity, whichever was reduced to zero. You do not regain items. 5. You lose your next turn, but the clock still moves. We’ve played this way several times and it definitely adds tension to the game without making it crushingly difficult. In addition, if you are using Unseen Forces, do not let the Chapel or First Aid Station get closed. If they close, you cannot regain stamina or sanity and you are truly devoured. There’s nothing I can do to save you. Sorry. Make a list of all investigators and a list of all Ancient Ones. The goal is to defeat ALL ancient ones while losing as few investigators as possible. Investigators and Ancient Ones must be randomly drawn at the beginning of each game. If an investigator is defeated they are considered dead/devoured and removed from the game. If an Ancient One is defeated it is permanently sealed and removed from the game. – Investigators who successfully seal an Ancient One gain +1 to Sanity and/or Stamina the next time they are randomly drawn. Benefits may stack each time an Investigator is successful. – Final Boss: Set Azathoth aside for when all other Ancient Ones are sealed. If Azathoth awakens during your final game the world is devoured and your campaign ends in failure, and YOU suffer -1 sanity. Don’t be afraid to use your clues early on rooms (especially on rooms that require 5+ total dice). The earlier you use clues the better chance you will have of being able to re-roll and complete a task instead of losing a die. Alternatively if you wait until you have just enough dice to complete the last task your chances are slim that you will re-roll the dice you need to complete it. – has a fellow investigator in it. So you can focus a die normally and one thanks to his/her assistance. Furthermore, your goal is to get Elder-signs as fast as possible, don’t forget that. And try to avoid taking big risks when the penalty are doom-tokens. I hear all the time that Elder Sign is too easy. Often, when pressed, it turns out that players are not paying the failure cost when focusing a die. When you fail a roll in Elder Sign, you set aside one die before continuing to roll another try at an adventure. If you choose to focus a die, you still must pay the cost of failure and set aside one die. This is in addition to the die that you are focusing. The same goes when assisting a roll. Also you must focus and assist on separate rolls. Making sure to pay these costs burns through your dice pool rather quickly. It adds tension to the game and raises the overall difficulty (and fun) level. When playing solo – spending your trophies on allies is one of the best investments – each one gives you valuable flexibility down the road, and their abilities can be used more than once. Characters that are able to change die results (e.g. Professor, Gangster, Photographer) will give you the best chance to win, while the Dilletante with her ability to add a yellow and a red is almost too powerful. Watch for monsters – it can become next to impossible to succeed if most of your adventures have tough extra requirements. Sometimes it might be worth to attempt and fail an adventure just to get rid of the monster. Try to imagine what happens as you succeed/fail on adventures. What was that -1 heart – did your character become violently ill after opening that chest and seeing what was inside? It will help bring the game to life. One thing I have found playing against Shub-Niggurath (at least in 1 player) is that I am constantly bombarded by creatures. And with Shub-Niggurath’s ability in place, killing monsters becomes an utter chore. Too often I have found myself fighting Shub-Niggurath 1-on-1, and then I realized that that is not a bad thing -at all. In fact this is my strategy to win against this particular Old One. The trick is spending your time focusing on specifically killing monsters or completing adventures that you know you can handle. You want trophies, because if you don’t have a trophy to sacrifice when Shun-Niggurath attacks, you are devoured. Also, if you are going to fight monsters on the board, you should, if at all possible fight the ones on adventure cards where if you fail, you get a Doom Token. The reasoning is this. More doom tokens means more monsters on the board, more monsters means more trophies and also with this strategy it would take forever waiting for the doom track to fill up relying on just the Mythos deck. That being said, do make sure you have at least each player has about 3-4 trophies each (6-8 in a 1 player game) and you should have a very good chance beating Shub-Niggurath when it awakens. – All investigators are “hc characters”: You only get that one investigator per game. If either or one of you dies, you all lose. The game is way too hard to lose if you can browse through every investigator available when the previous one is devoured. This way there is an actual “fear” of losing. Might also make the game a bit longer if you fail a lot of adventures. I’ve heard a lot of people suggest the iOs edition is a little better than the physical edition. I practice the game and get to grips with it on the iOs edition so I’m more familiar with rules. I’ve had a few more winning runs this way. I saw this variant on BBG a while back and decided to implement it. Now that I’ve done it, I will never play without it! The last few games I played before this variant felt a bit too easy, honestly. This helps to add to the tension and atmosphere as well as the difficulty. 3) Any time a game effect calls for the appearance of a monster,and all the cards are either facedown or contain a monster already, flip one adventure card faceup in random, and put the monster there. 5)Each time any investigator successfully completes an adventure, he/she may spend 1 Clue Token to flip over 1 card and look at it, then he/she must return the card facedown. 7) Optional: Each time the clock strikes Midnight, add an additional doom token to the doom track, before resolving the next Mythos card. It took around 50 games, but I finally managed to lose at Elder Sign. However, I had to use this house rule to make it happen: trophies are useless. No going to the museum entrance to purchase allies or items, and definitely no going to the museum entrance to purchase Elder Signs (allowing this was a big error by the designers in the base game, which they subsequently fixed in the expansion). You can keep your trophies as a visual representation of how well you’re doing, or tuck them back underneath their respective piles immediately, but can’t receive future value out of them. I like the game much more this way. I’ve finally lost (a necessity when playing a coop game), but the other 10 or so games I’ve used this modification on were much closer victories than I’d previously been used to. We’re still likely to lock the Ancient One away, but it will only be a doom token or 2 from awakening when we do. No more of those 30 minute games where they’re locked away with the doom track only half-full. When placing a monster, it cannot be put on an adventure that already has a monster, unless there’s already a monster on every adventure; then any further monsters should also be spread as evenly as possible. This prevents the strategy of simply piling up a load of monsters on a single adventure that will never be attempted. [Edit 8 Jan 2012]: Looks like this is now an official rule, according to FFG’s FAQ. First of all, make sure you learn the purpose of the Yellow dice. Because the game makes you pay to use it, it’s easy to think of it as better in all circumstances, but in fact the Yellow dice is only better for collecting Investigations. Notice that the Yellow dice doesn’t have a Terror symbol – so if that’s what you need to roll for your quest, using the Yellow dice might be making your quest harder! Secondly, try to use Clue tokens when you have plenty of dice left. It’s tempting to save them for ‘one last roll’ when you’re one dice away from failing, but by that time you have already reduced your chances of success dramatically. Use the token with 4 or 5 dice left and you’ll find Clues are far more powerful. One of the most anti-climatic ways to win the game is to just buy enough Elder Signs for the win. This was actually addressed in the Unseen Forces expansion where it’s no longer allowed. I suggest banning purchase of Elder Signs (earn these the hard way!) but allowing two purchases per turn to keep trophies relevant. This is yet another variant I started fiddling around with. Like it so far but I haven’t been able to get a group together to playtest it like it needs. -Each person chooses a character to play as at random. -Choose a Great Old One at random. Note the amount of Doom Tokens needed for that Great Old One to manifest. -Shuffle the adventure deck and remove the top 6 cards (or 9 if you are playing against a GOO with a requirement of 10 or more Doom Tokens to manifest). Set those cards aside. -Place Adventure Cards face down in two rows of three (if you are playing against a GOO with a requirement of 10 or more Doom Tokens to manifest, place 9 cards down [making 3 rows of 3]). Keep placing an additional card on each of these until you run out. Each pile should have an even amount of cards to one another. 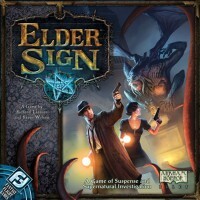 Players must work to protect the museum against the horror of the Great Old Ones by collecting Elder Signs and sealing off the portals hidden in the depths of the museum. -During a player’s turn he/she moves to an Adventure Card and attempts to complete it. If the player successfully completes this adventure he/she takes the rewards on that card. If one of the rewards is an Elder Sign, place that on the complete Adventure Card. This room has now been sealed. -Not every Adventure cards will have an Elder Sign as a reward. The only other way to obtain an Elder Sign is to collect enough trophies to obtain one from the gift shop. -When a players purchases an Elder Sign, his/her resolution phase ends. -Once an Elder Sign is purchased it does not immediately go on an Adventure Card. Players own that Elder Sign once they purchase it and must move to the Adventure Card (portal) they wish to seal and place it on it. Once placed, this ends that player’s resolution phase. -If a card or effect would allow you to draw an additional Adventure card to be placed in game, instead draw that card from the bottom of any of the piles in play. You may chose to remove that card from the game or instead put it on the top of that pile. When I play Elder Sign solo, I only play one Investigator. I think it’s a good challenge level, to replace all your items when one dies and has to be replaced. So, there’s no reason to go digging out the token specific for a given Investigator when you swap them out. I added a generic token to the game, a white metal miniature of a generic cultist-looking sort of person to move around. It’s very thematic and works nicely. When you pick the Ancient One and investigators do it by random. If you get to pick your investigators this game becomes very easy, it works for mobile version because its notably more difficult. Randomizing the selection forces you to adjust to the situation and increases the difficulty slightly. Every time Mythos card states “Add 1 doom token, unless…” add one doom token and if the unless part of text is completed add another doom token. This increases difficulty notably and makes game more urgent, leaving less interest and time to browse the shop or heal your stamina/sanity. Needless to say remove ability to buy Elder Signs from shop (as said variously here). I have tested the idea posted here about playing with the rooms face down and it sure is more challenging, but if you wanna go for a still more challenging game, try this too. Whenever a player loses health, that player has to roll an amount of dice equal to the total – the health lost when completing any task, and this way there will be certain moments when some room will be even impossible to complete for a while.